My child would have pasta every day. When I ask her what she wants for dinner, she says, “PASTA” every. time. I find this to be a huge coup, considering we’re gluten free. Even sadder face that I must tell you, after five years of eating gluten free pasta, Barilla is hands down the best I’ve ever tasted. 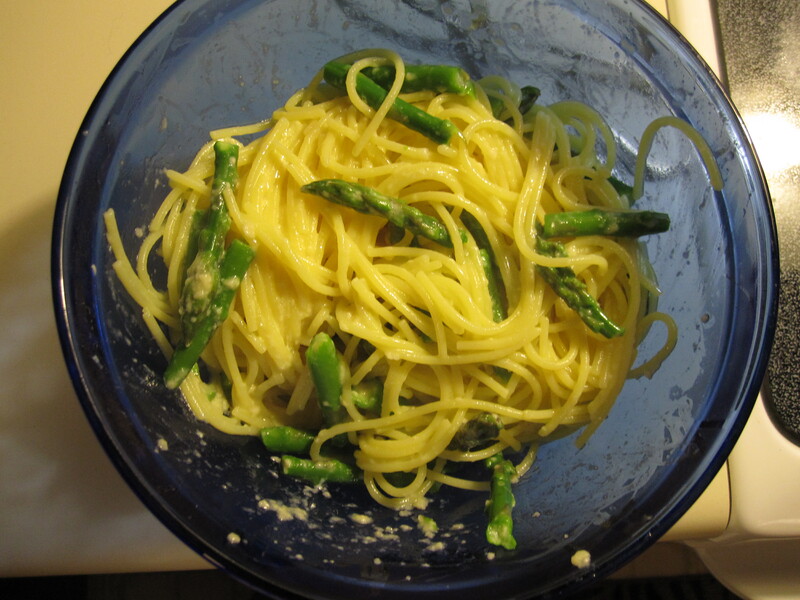 I cooked the pasta, and with about 2 minutes left, I added broken bits of asparagus. In a separate bowl, I whisked together 1 egg and 1/6 cup of Parmesan cheese. I tossed the hot pasta in the egg mixture. It was Ah. Maze. Zing. You could easily cook some bacon and reduce the grease with white wine. It is not going to break my child of her pasta habit. And, now…I’ve got one myself. I have always cleaned on Saturdays. My ex-H hated it. “You’re wasting the whole day inside.” Didn’t matter if was raining or sunny, he couldn’t deal. I had never really thought of it before, but he was right. I guess when you’re single and working and socializing, not a lot gets done on a Saturday day, so I cleaned and did laundry. It’s a horrible habit. Especially now that I have a child. She certainly does not enjoy sitting around and watching me clean. Today was no different. (I’ll learn…eventually.) I did laundry and dishes (always with the dishes). Straightened up a bit here and there. Wrote out the grocery list. Plopped her down in front of Enchanted. At the grocery, I restrained myself from most things, and then heard myself saying aloud, “Let the child have some damned hot chocolate.” I should be making it from scratch (as my dear friend of Candy Coated Reality pointed out), but sometimes you just have to let go. Today was one of those times. When I got home, I couldn’t get the chips and salsa out of the bag fast enough. Then, I had gluten free Udi’s cinnamon raisin toast with Nutella. It was $1 off, and it’s quite delicious. 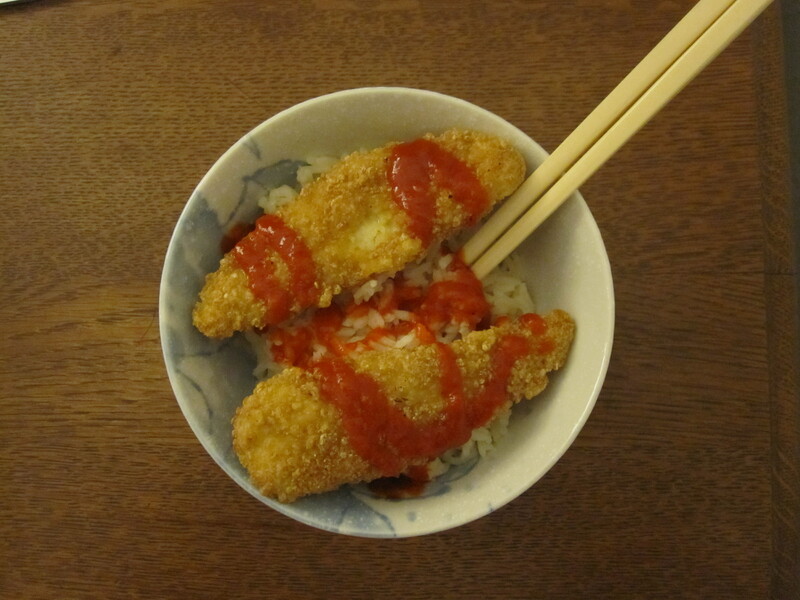 Then…I had rice with gluten free chicken tenders and sriracha. I found the tenders at Target, and I have to admit…they are quite tasty. I may be the only person with sriracha left in the whole world. There is not expiration date on this thing, so who knows if I’m eating poison or not. Mmm. Delicious poison. I previously mentioned my crazy dry eye issue I’ve been having. 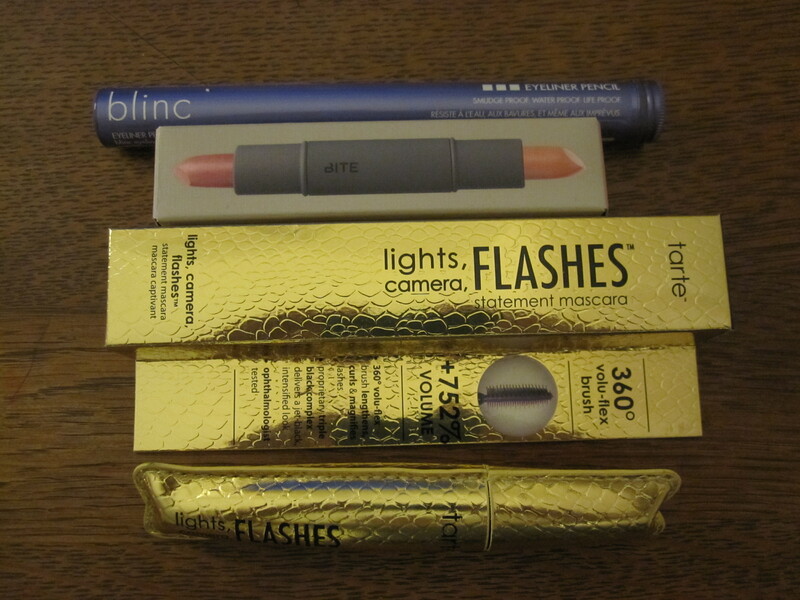 I got to wondering about the eye liner/mascara/eye shadow I was using. I would look at myself in the mirror and almost see the red veins popping out on my eyeballs. There wasn’t a mention on the packaging of anything derived from gluten, but you never know. I am liking them very much. I think the eyeliner has made a big difference. The texture is quite nice. The liner goes on very easily, and is easy to wipe off when you make a mistake which I often do. The lipstick is very lovely. I should have taken a picture of it opened at either end. It has two colors, a light-ish pink and a darker rose color. I only use gluten free lip products since you basically eat lipstick. And, I know people say that no one should be affected by topical products that contain gluten. I find that to be a real piece of malarky, considering skin is the largest organ in the body. Hello? Transdermal patches, anyone? The mascara is also quite lovely. Except for the fact that I am a freaking idiot and could not figure out how to get the freaking thing open. That gold contraption stays. I was trying to pull it off and ripped off the cap. When I put it back on, it was misaligned and ain’t nobody got time for that. I remove my eye makeup with olive oil, and after smearing that on (and on…and on…and on…) I looked like I’d just gone five rounds with Mike Tyson. It has some staying power. But, it’s gluten free. And it didn’t bother my eyes at all. I’m going to go with it. Tomorrow, I will end the evening making a chocolate cake with chocolate icing. I have serious issues. I’d rather have a piece of cake than crappy chocolate. Wait. That’s not true. I’m not picky about chocolate. It’s a sickness, okay. Leave me alone. I haven’t had a complete failure in the kitchen in a very long time. Last night…was epic. I don’t even know what to say about that hideous mess. 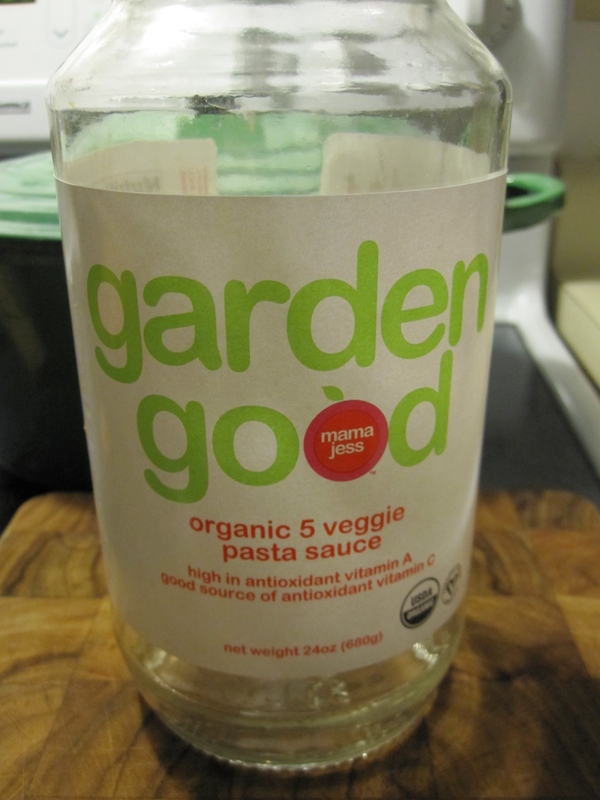 The sauce tasted like your fork when you would accidentally rub it on your TV dinner. Do not buy this. It is foul. But you probably won’t listen to me, and you’ll buy it anyway, and then I’ll say, “Oh, I’m so sorry!” because I am not one of those “Told ya” kind of people, so if you want to waste yo’ monies…feel free. Here’s my shoulder. Sweet daughter had a hot dog and pickles for dinner, and I grabbed the bag of corn chips and some salsa. Emptied the jar into my favorite salsa bowl. Opened the chips. And they were FREAKING NO SALT ADDED. WHO DOES THE FAHKING SHOPPING AROUND HERE? Then today, I worked from home and every. single. thing. I ate was some form of chocolate. I made my frittata for breakfast. My daughter was still hungry, so I chopped an apple for her and gave her some caramel. She didn’t finish all the caramel, so I threw it away. Then I got it out of the garbage and put it on some chocolate coconut milk Trader Joe’s ice cream. That was a low point. And it wasn’t great on it, either. At dinner, I burned my child’s pizza, and the snicker doodles. Last year, our staff meetings at work were first thing in the morning. This year, they’re last thing in the day. Last year, I would bring in elaborate breakfasts for my coworkers. We have new employees this year who haven’t had the pleasure of eating some of the lovely things I like to make before work. I do recall one meeting last year where everything I made was shaped like a muffin. 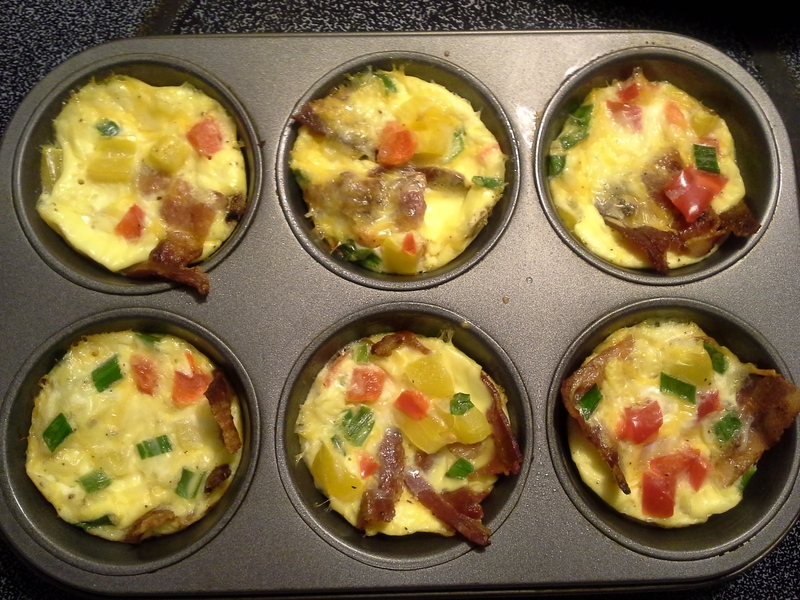 I only made six today, instead of the normal twelve because…well, because I only had three eggs. Spray the tin with non-stick spray. 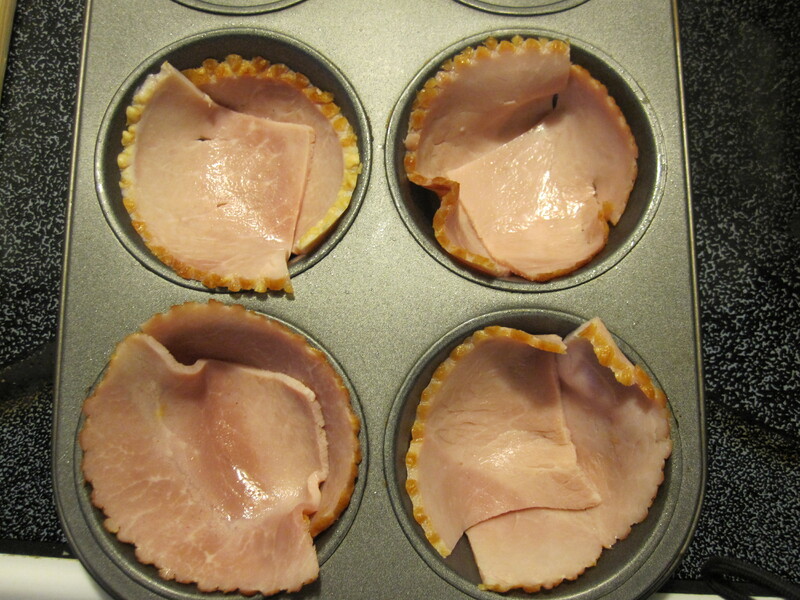 Break one strip of bacon into three pieces and layer in the tin. Beat the eggs with the remaining ingredients. 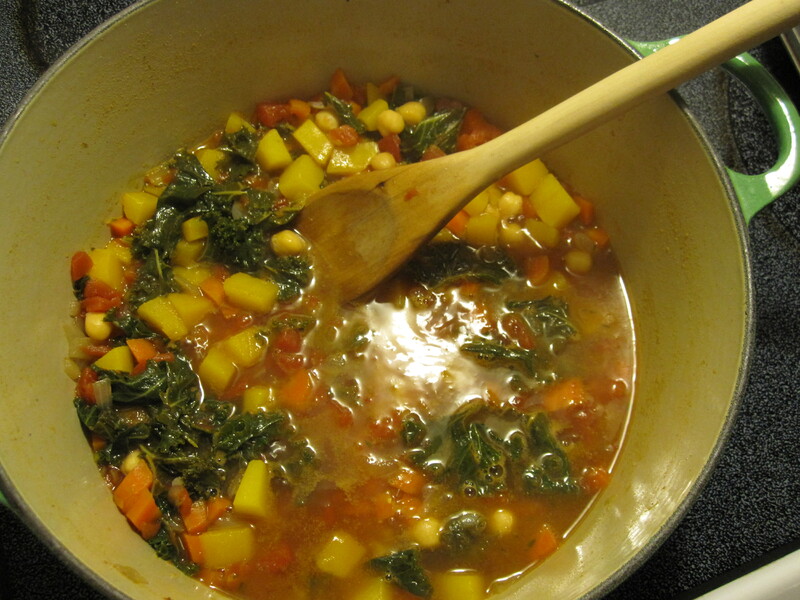 Add 1/4 cup of the mixture to each tin, or eye it. I did spoons full until it came out even. Bake on 350 for 25 mins., or until set. And wouldn’t you know it? No one is here this morning at work. If I didn’t have a child (cannot even imagine such a thing), I would spend nowhere near the amount of money I spend on groceries every week/month. I cannot believe what two people eat, especially two rather small people. I would go back to my weird habits of eating chips and salsa for dinner, or cereal, or…cookies and milk. The child wanted pizza tonight, so I did a little experiment for my own dinner. I had two slices of ham that I cut into triangles. 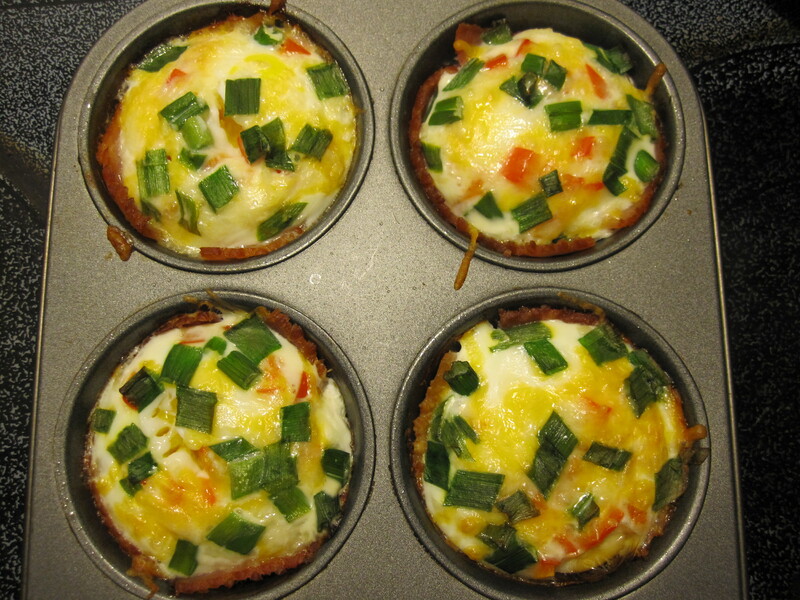 I layered two in muffin cups that had been sprayed with non-stick spray. I cracked one egg into each cup. 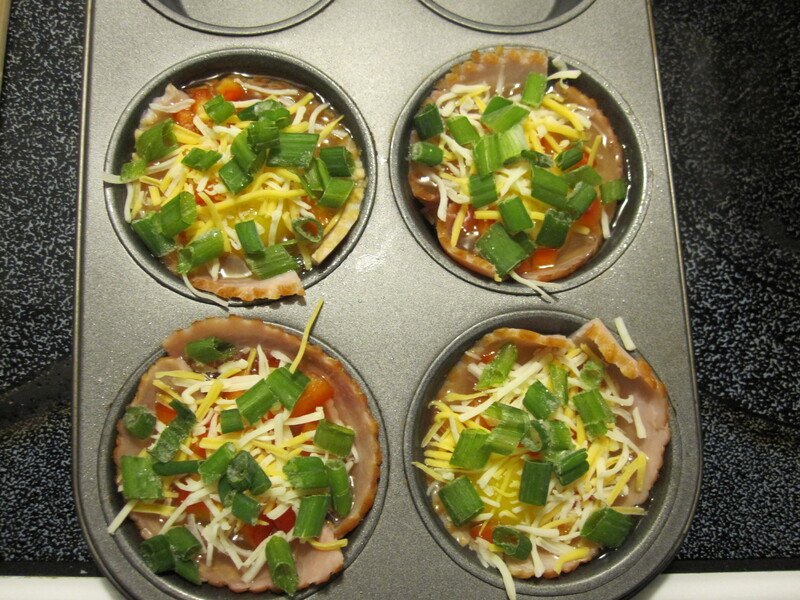 I added chopped red peppers, shredded cheese, and scallions. Next time, I think adding some thyme or crushed red pepper would be good. 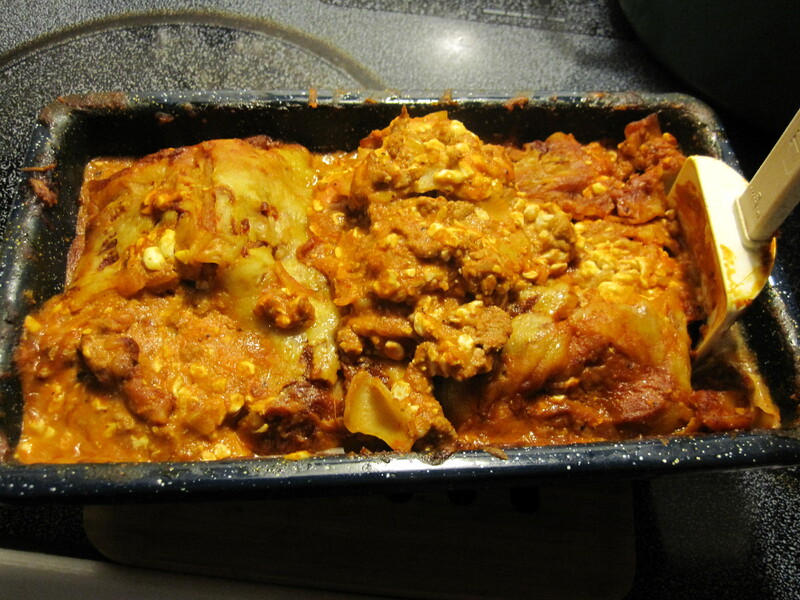 I cooked them at 400 degrees for about 18 minutes (13 mins., back in for 3 mins., back in for 2 mins.). 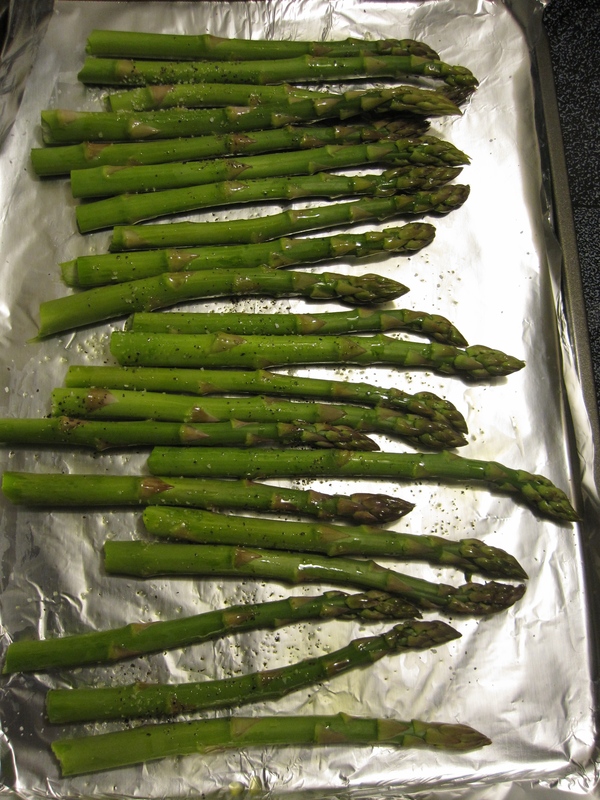 After they were finished, I sprinkled them with a little kosher salt and black pepper. I ate one. Then two. And the last two snicker doodles.